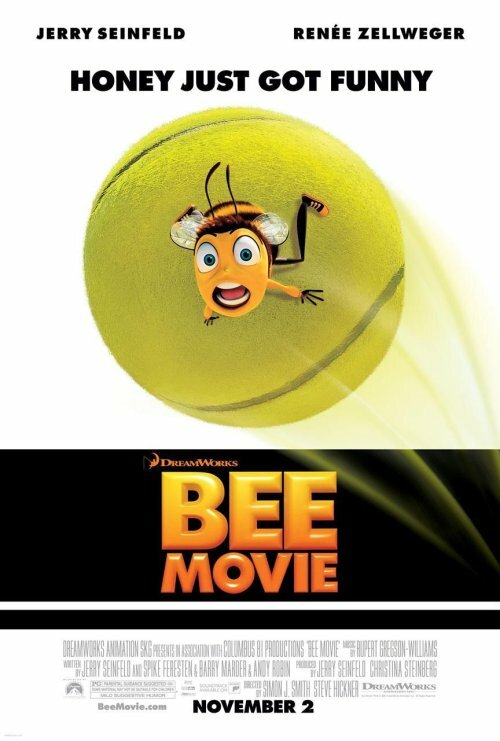 You know, when I saw the “ball hits bee” scene in the trailer for Bee Movie I didn’t find it funny. Seeing what amounts to a still of that same scene doesn’t make it any funnier. And since we are talking about unfunny things, that tagline? Honey just got funny? Yeah, not doing it for me either. Selling a computer animated movie has gotten a lot harder in the last couple of years. There are a lot of players in this space now, so the novelty has worn off. And most movies that weren’t counting on an already powerful brand (Shrek, Pixar) have had middling results. I’m not seeing much in Bee Movie to make it stand out from the crowd of animated movies with cute (are bees cute?) talking animals. The one thing it has is Seinfeld, and they have been very creative in trying to use him in the campaign. But this being an animated movie there isn’t much the poster can do beyond putting his name in there. And that ain’t much. It’s like you’re asking for trouble when you come out and say that a certain visual is funny (even though it’s meant to describe the movie, it reads that it’s describing the scene pictured). Probably too much to ask, but it’d be great if the copyline could communicate some story – eg, “He just wants to bee alone,” “Too hip for the hive,” “God save the Queen,” etc.